Lots of sparkle this week, with Kate, Max, Stephanie, and Sonja showing off a bit of glitter. 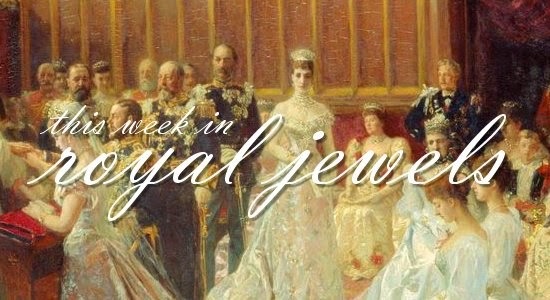 When you're done enjoying the royal jewels worn this week, head over to The Royal Roundup for a rundown of the many major royal events taking place in June! 10. The Duchess of Cambridge -- or, for the day, the Countess of Strathearn -- spent the day with her husband in Scotland on Thursday. She debuted a new brooch for the occasion. Royal reporters shared that the brooch, which features a Celtic knot design, was one of Kate's wedding gifts, though the identity of the giver has been kept private. Today, emeralds are one of the most desirable precious gemstones out there, and nearly every royal collection has at least one major emerald piece. Here's my top ten list of royal emerald jewelry. Feel free to offer your own list in the comments! 10. The Greek Emeralds: Originally from Russia, these cabochon emeralds came to Greece with Olga Constantinovna, wife of King George I. They have been set and reset various times; the current parure dates to the era of Queen Elisabeth (whose initial can be seen in the design of the tiara). 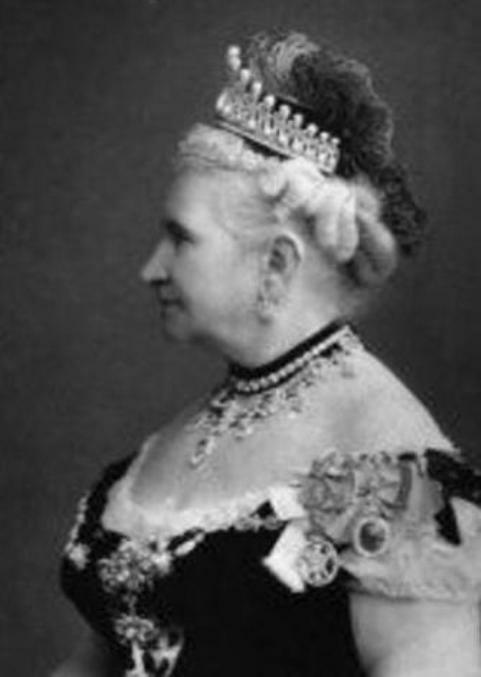 Today, they're worn by the former Greek queen, Anne-Marie (pictured above). "Americans Share Court Ball Honors"
Several Americans who were presented at the recent Courts were disappointed at not receiving invitations to the State ball given in honor of the French President's visit , but, owing to the number of those whose official positions gave them first claim, the Lord Chamberlain was obliged to be as adamant to many supplications. Mrs. Whitelaw Reid , as the wife of the American ambassador, was, of course, there, and all other ladies of the Embassy. Ogden Reid, who has come over for his sister's wedding, was also present. Mrs. Reid wore a handsome dress of pale heliotrope satin. Mrs. J. Ridgely Carter , who brought her daughter, wore white satin, veiled with black tulle and strewn with diamonds. Her jewels included a diamond tiara, a dog collar, and a rope of pearls. Miss Mildred Carter, who always looks charming, wore white satin and tulle and had no jewels. Mrs. Gibbons  and Mrs. Cloman  were both in white. Mrs. John Jacob Astor , who was not at the Court on the 22nd, as reported in some papers, was at the State ball, and looked beautiful in white satin and diamonds. Can you identify the jewels worn here by Princess Sibylla of Sweden and her eldest daughter, Princess Margaretha, to a gala dinner in 1954? Happy birthday to our Magpie of the Month (and, really, the patron saint of royal jewels), Queen Mary! Her Serene Highness Princess Victoria Mary of Teck was born on May 26, 1867. Even though she was technically a German princess (her father was the Duke of Teck, who was a sort-of member of the royal family of Württemberg), her mother was a British princess, and May was born in Kensington Palace. And we all know what her ultimate fate was: she was the wife of one king and the mother of two more, and the jewelry worn today by members of the British royal family would look a lot different had she not had her royal paws on the collection. Today, we're looking at our last spotlight piece (for this month, anyway) from Mary's own collection: her diamond honeysuckle tiara. The provenance of this tiara was a bit fuzzy for years. Some thought the piece was one of the items that came from the estate of Tsarina Marie Feodorovna of Russia (sister of Queen Alexandra). But although the piece does resemble some Romanov tiaras, that wasn't the case. It was actually commissioned by Mary herself shortly after she became queen. Yesterday, Queen Victoria celebrated her -- ahem -- 195th birthday. To mark the occasion, today we're looking at one of the most important Victorian tiaras in the Windsor collection: Victoria's Oriental Circlet. In terms of royal provenance, it doesn't get much better than this tiara. It was not only worn by Queen Victoria but also designed by her beloved Albert, and it’s the only one of the four tiaras designed by Albert that is still owned by the main branch of the British royal family . The piece, which includes arches and lotus flowers inspired by eastern designs, was dreamed up by the Prince Consort after he saw jewels featuring similar motifs at the Great Exhibition, the landmark event that proved to be perhaps his greatest royal legacy. The Royal Collection's website notes that Albert "had been greatly impressed by the Indian jewels presented to the Queen by the East India Company at the conclusion of the Great Exhibition" . The Moghul arches and lotus flower designs in the circlet were inspired by those jewels. Much of the royal attention over the past two weeks has been focused on a series of anniversaries -- milestone wedding anniversaries in Denmark and Spain, and an important constitutional anniversary in Norway -- but in the midst of all of that, the Prince of Wales and the Duchess of Cornwall made a trip across the pond to Canada. The nation's future king and his wife visited three provinces and met lots of Canadians along the way. Let's have a look at the jewelry that Camilla packed in her hand luggage for the tour, shall we? The royal couple landed on Sunday in Halifax to begin their four-day visit. With a pair of small pearl pendant earrings, Camilla wore a pair of brooches that she's donned at some important occasions for the royal family. The diamond brooches are shaped like four-leaf clovers. She wore them at Prince William's wedding in 2011, and for her first Christmas as a member of the royal family at Sandringham in 2005. 10. Although the super-packed June schedule for the Windsors (Garter Day, Trooping the Colour, Ascot, D-Day Celebrations) is still a week or so away, Queen Elizabeth II has been busy with engagements already. For a visit to the HMS Lancaster in Portsmouth on Tuesday, she sported one of Queen Victoria's bow brooches. Ten years ago today, the biggest royal wedding to be held in Spain in nearly a century took place in Madrid, when Letizia Ortiz Rocasolano, a Spanish journalist and television news anchor, married the heir to the throne, Prince Felipe. Because the wedding was a daytime affair, the guests weren't dripping in jewels as they had been in Denmark a few days before (when the Danish crown prince was married -- see here and here for a recap of that wedding!). 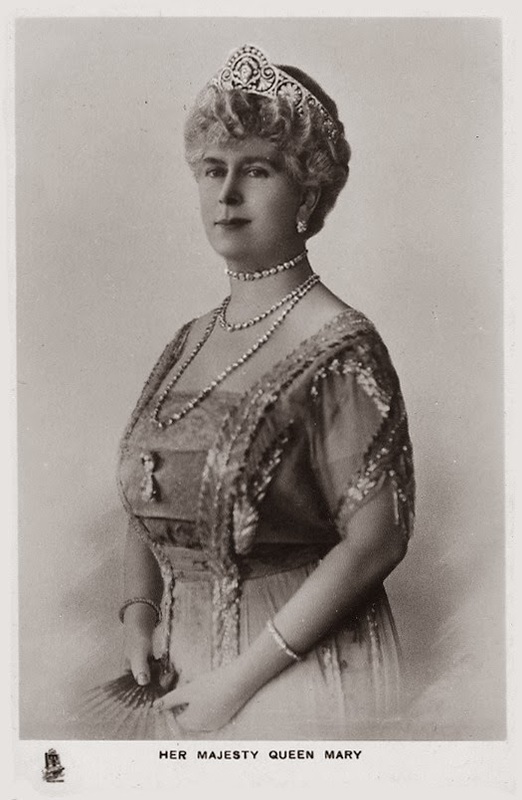 Our penultimate look (this month, anyway) into the collection of Mary of Teck brings us to a piece of jewelry that, although she commissioned it herself, was actually made more famous by a subsequent wearer. The lover's knot tiara that Mary had made to resemble the tiara owned by her aunt, a Cambridge princess, is probably more recognizable to readers today as one of two tiaras worn by the late Diana, Princess of Wales. While the piece is definitely the most famous lover’s knot tiara today, it was originally a copy of another almost-identical sparkler that once belonged to the Cambridge family. 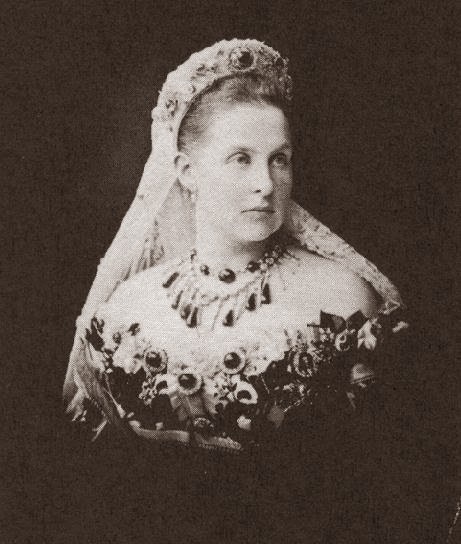 The lover’s knot motif was very popular in the nineteenth century; the knots are the pretzel-like elements at the top of the tiara -- the part from which the pendant pearls are suspended. There are several lover's knot tiaras still existing today, including one that belongs to the Bavarian royal family and one that comes from the collection of the Patiala maharajas. Augusta of Hesse-Kassel, the first Duchess of Cambridge, received a lover’s knot tiara as a wedding gift in 1818. Augusta loved her lover’s knot tiara, so much so that she chose to wear it at the coronation of her niece, Queen Victoria, in 1838. 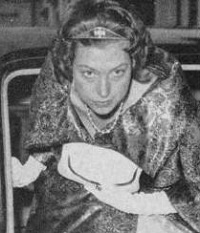 After Augusta’s death, the tiara was inherited by her daughter, Augusta Caroline; it was then passed along through the family before eventually being sold in 1981. But long before it was sold, the original Cambridge lover’s knot caught the eye of one of the most notorious royal jewel mongers around: Queen Mary. You’ll remember that Mary was a member of the Cambridge family herself; her mother was Princess Mary Adelaide of Cambridge, Augusta’s daughter. On April 29, and rather unexpectedly, writes the Geneva correspondent of the London Times, the sale of the Brunswick jewels was brought to an unsatisfactory close. There is much disappointment at the result of the sale, commenced a week ago, and continuing from day to day ever since. At first, the competition was brisk, and good prices were realized, but with the third day of the sale a marked decline set in, which went on decreasing until today, when the sale may be said to have actually died out for want of bidders. On the first day -- i.e., April 23 -- twenty-four lots were sold, realizing 96,425 francs, of 27,000 francs over the reserved price. On the second day, the thirty-six lots sold produced 293,230 francs, about 35,000 francs over the upset price. On both days several lots were withdrawn because of the upset price not being offered -- viz: (in all) 45,520 francs on the first day, and 11,550 francs on the second day. Since emerald is the birthstone designated for May babies, I thought it only fitting that we consider how we'd re-imagine one of the most valuable emerald tiaras ever to hit the auction block: the emerald and diamond tiara made around 1900 by Chaumet for the second wife of Guido Henckel von Donnersmarck, a German industrialist and aristocrat. If you had the chance to make changes to this rather interesting emerald sparkler, what would you do? Can you identify the jewels worn here by Princess Astrid of Norway (pictured with her father, King Olav V) in 1960? The pair are in Belgium for a major royal event -- bonus points to those who can guess which one! When you first dig into the history of the Scandinavian royal families, one of the first things you notice is the plethora of empresses, queens, and princesses named "Josephine" in the family tree. Because of that, there are many opportunities to confuse the royal Josephines with their various tiaras. But the Josephine associated with this lovely diamond tiara is clear: it comes from Queen Josefina of Sweden and Norway (née Princess Joséphine of Leuchtenberg), the wife of King Oscar I and the granddaughter of another famous Josephine (that would be Napoleon’s Empress Joséphine). So many Josephines! 10. If you've been reading the blog this week, you're more than aware that Crown Prince Frederik and Crown Princess Mary of Denmark celebrated their tenth wedding anniversary on Wednesday. (If you missed them, our royal jewel rewind posts on the wedding are here and here.) To celebrate, the Danish court released new portraits of the couple. Mary wore one of her most sentimental pieces of jewelry: the sapphire and diamond brooch that once belonged to the Duchess of Connaught. Today marks the tenth anniversary of one of the most glittering royal weddings held during the twenty-first century so far: the marriage of Crown Prince Frederik of Denmark and his Aussie bride, Mary Elizabeth Donaldson. Ten years later, the pair are still happily wed, with four children and a busy slate of royal engagements to keep them occupied. But today, let's set our time machines to May 14, 2004, and reminisce a bit about the staggeringly gorgeous jewels on display that day in Copenhagen! (And, when you're finished with part one of this pictoral trip down memory lane, head over to The Royal Roundup for a playlist of videos from the wedding day, including a weepy Frederik, a touching groom's speech, and an adorable bridal waltz!) And, because there were so very many jewel-laden royals attending this wedding, be sure to drop by tomorrow to see the second part of this sparkling spectacular! The sale of the Crown jewels seems to have excited more interest in America than it does here , where little is felt and still less manifested among the natives. From the crowds who visited their exhibition at the Pavilion de Flore , the representatives of the so-called directing classes were persistently absent. The people who did go to stare at the jewels were either foreigners or petits bourgeois, who went to satisfy their curiosity, but without any idea of bidding for a single article when they should go to the hammer, knowing that everything would be done to protect the interests of dealers, who, as always happens at the Hôtel Drouot , combine systematically to run up prices whenever an outsider presumes on competition. Several other considerations also combined to cool the enthusiasm of at one time intending purchasers. The weight of uncut stones only is guaranteed, while, as the catalogue expressly warns the public, it is merely given approximately for the pièces montées. And here comes in another question: are the stones now in these latter the same which were there originally? Experts admit that they cannot be sure on this point, and this is notably the case in regard to the so-called seven Mazarins , which under that name were in the imperial crown, and which, though in a case bearing an inscription, Mr. Bapst  cannot swear are those so designated in the civil list. 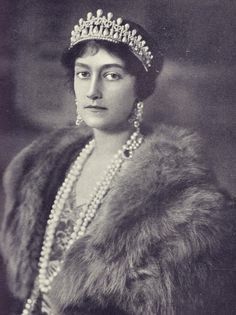 Our second foray into the extensive jewelry collection of our Magpie of the Month, Mary of Teck, takes us to the tiara that became an important bridal diadem for the Windsor women in the twentieth century. Often confused with the many other fringe tiaras and necklaces in the royal collection, Queen Mary's fringe tiara is a piece that was created on her own commission. This tiara is often misidentifed as the “George III Fringe Tiara” or the "Hanoverian Fringe Tiara." But don’t let the internet (and even some books) fool you — it’s not the same tiara! The so-called George III or Hanoverian Fringe was a fringe necklace that belonged to Queen Adelaide, the wife of William IV. It was worn in various ways (including as a tiara) by Queen Victoria, Queen Alexandra, Queen Mary, and Queen Elizabeth, and it is now the property of the current queen. But it’s a totally different piece. Hugh Roberts called Queen Adelaide's fringe a tiara of "less finely graduated form," noting that it is "now set as a necklace" (and presumably cannot be easily converted to be worn as a tiara). Queen Mary's fringe (worn above by the Queen Mother), on the other hand, he describes as a "new, smaller, neater and more modern-looking tiara" . This week, the Grand Duchess of Luxembourg selected the family's aquamarine jewel suite for a banquet held during a state visit to Poland. The set is one of the grand ducal family's many twentieth-century jewel treasures; today, we're talking about the tiara from the parure, a bandeau made of diamonds and aquamarines. It's Friday yet again, magpies -- time for another round of the week's best bejeweled news! 10. A new portrait of Queen Elizabeth II by photographer David Bailey was released on Thursday. The photo, which was taken as a part of the GREAT Britain campaign, features the Queen wearing the George VI sapphires, a nineteenth-century suite of diamond and sapphire jewelry given to her as a wedding present by her father. Time for another new feature category here at The Court Jeweller: The Top Ten, in which we count down the best (and worst) of royal jewelry. Today, we're celebrating my recent relaunch of classic posts from the Mad Hattery! blog with a rundown of my votes for the top ten Maddest Tiaras in modern royal collections. Have a glance at my picks, and then weigh in with your top ten list in the comments below! 10. Princess Madeleine's Aquamarine Bandeau: The hunt for the maddest tiaras makes its first stop in the Bernadotte family vaults in Sweden, where this simple yet strange bandeau resides. It's the tiara given to Princess Madeleine for her eighteenth birthday; for many years, it was one of the only tiaras she wore. The piece is actually an heirloom, but that hasn't stopped many royal watchers from affectionately (or not?) dubbing this one "the Cyclops." 9. 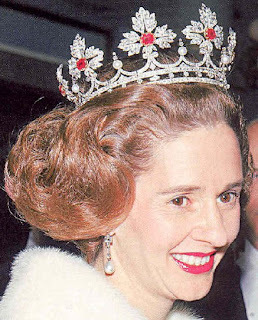 Queen Fabiola's Spanish Wedding Gift Tiara: Here's a case where a transformable tiara can go from lovely to completely mad with a few flicks of the jeweler's tiny screwdriver. 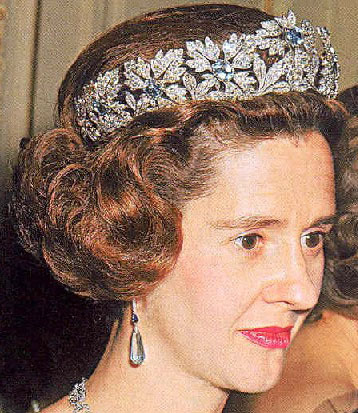 The tiara given by General Franco to Queen Fabiola of Belgium as a wedding gift is perfectly lovely when it's arranged as a floral wreath tiara. But when its floral elements are propped up atop a coronet, it goes from elegant quite quickly to something ... else. Let's put it this way -- would anyone have been surprised if this coronet had shown up during one of Lord Snowdon's over-the-top '60s royal spectaculars? Nope, me neither. In our inaugural month of May here at the Court Jeweller, was there any other possible choice for Magpie of the Month than "May" herself, Queen Mary? 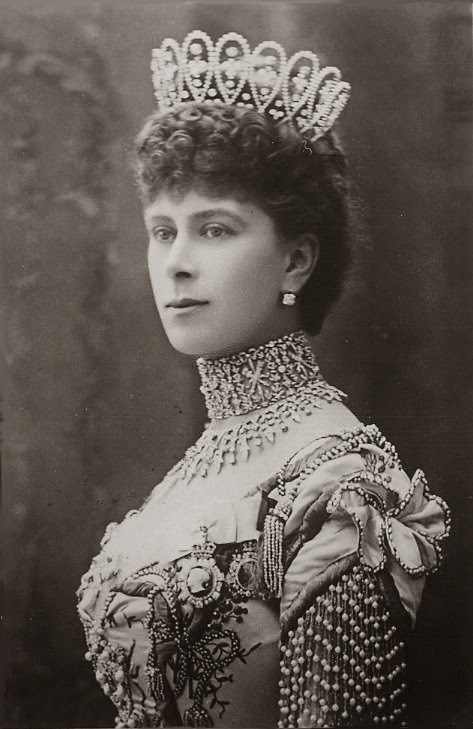 Born in May, Victoria Mary of Teck was the queen consort of King George V of the United Kingdom, and she was one of the most innovative jewelry collectors and wearers of her era. The daughter of a German duke and a British princess, the wife of a king, and the mother of two more kings, Queen Mary is also the grandmother of Britain's reigning monarch, Queen Elizabeth II. May's jewel collection is legendary, and this month I'm going to be spotlighting some of the rarer pieces from her jewel box. First up: one of her most elaborate choker necklaces, the Love Trophy Collar. "Gem of Queen Olga's Held Here for Duty"
Queen Olga , mother of King Constantine of Greece , is in such circumstances that she is reported to have offered some of her jewels for sale. It has just become known here that she recently sent a young Greek officer to the United States with a large emerald brooch with instructions to dispose of it at the highest price. The young man was dressed in civilian clothes and served as a mate on the steamer, which was the King Alexander. Upon arriving in New York he failed to declare the jewel, and he was arrested and imprisoned for twenty days. He was also fined $700, which was the foreign value put upon the brooch by the customs authorities. The captain of the vessel also was penalized for failing properly to acquaint passengers with American customs requirements. In 2012, Queen Elizabeth II became the second British monarch to celebrate sixty years on the throne -- a Diamond Jubilee. Such an occasion required much commemorating, including festivities, pageants, concerts, parties, and museum exhibits. As the event was a Diamond Jubilee, several books on the Queen's jewelry collection were also published to coincide with the anniversary. 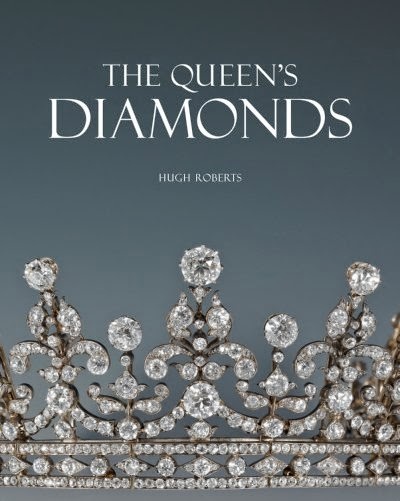 I've already reviewed two of them here -- Diamonds: A Jubilee Celebration and Dressing the Queen -- and today, I'm reviewing the biggest and most important of the trio: Hugh Roberts's The Queen's Diamonds. I'll be frank from the start: this review is going to be glowing. Roberts's book is the most beautifully-packaged and well-researched book in my entire collection. It's printed on heavy, glossy paper, and it features photographs that are incredibly beautiful and detailed, including pull-out pages that provide exceptional close-ups of some of the most famous jewelry items in the royal collection (specifically, the Dagmar Necklace and the Vladimir Tiara). The text is also formatted in a way that's very visually pleasing. This was a book that I decided to savor as soon as I opened the package, reading bits of it at a time to help to prolong the glee that accompanied reading a book that felt as fancy as this one does. And it took a while, as the book is rather enormous: it's 320 pages long, weighs more than five pounds, and has the dimensions of a large coffee table book. 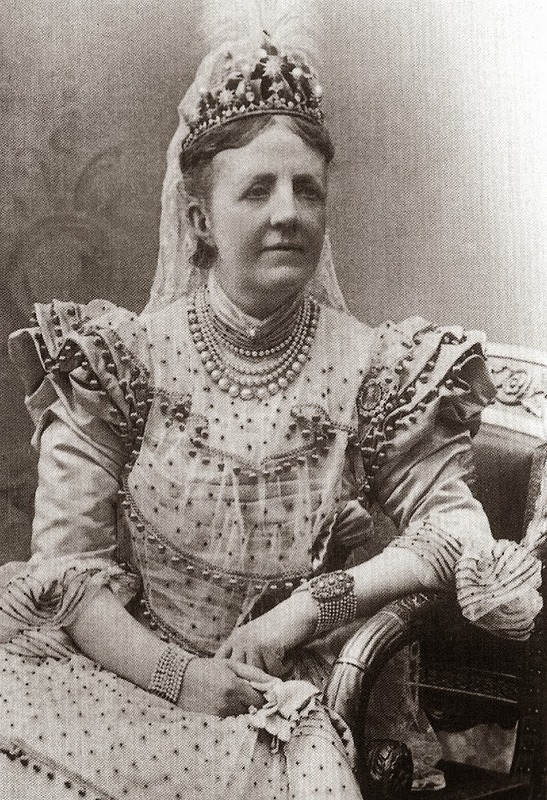 Can you identify the jewels worn here by Princess Mary Adelaide of Cambridge, Duchess of Teck? This week, the Princess of Sayn-Wittgenstein-Berleburg -- better known as Princess Benedikte of Denmark -- celebrated her seventieth birthday. She's the daughter of King Frederik IX and Queen Ingrid of Denmark and the sister of two more queens, Margrethe II of Denmark and Anne-Marie (formerly) of Greece. As such, she has some pretty significant heirloom jewelry in her collection. Today's tiara is one of the ones that she inherited from her late mother. The first owner of the tiara was Queen Sofia of Sweden, who was born a princess of Nassau, a German duchy. When she married the crown prince of Sweden (later Oscar II) in 1857, she received this tiara as a wedding gift. 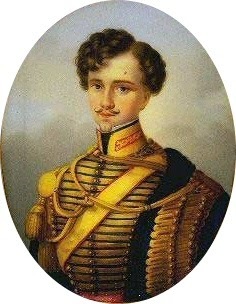 The giver was her brother Adolphe, who would later become the grand duke of Luxembourg. The tiara, which features alternating diamond stars and pearls set on diamond spikes, was apparently made about the same time, dating it to the middle of the nineteenth century. As the showers of April bring on the flowers of May, let's turn our creative attention to one of the most polarizing floral tiaras in any royal collection: Queen Elizabeth II's Burmese Ruby Tiara. Made from the diamonds of a dismantled floral diadem -- the Nizam of Hyderabad Tiara -- and a cache of rubies given to the Queen as a wedding present, the tiara features stylized Tudor roses, which combine the red rose of Lancaster and the white rose of York into one harmonious bloom. If you had the chance, how would you redesign this '70s-era sparkler?